It's been snowy here for the last few days, well below freezing for the first couple of days and then warming to melt some, freeze some. Of course we developed icicles -- nothing odd about that. 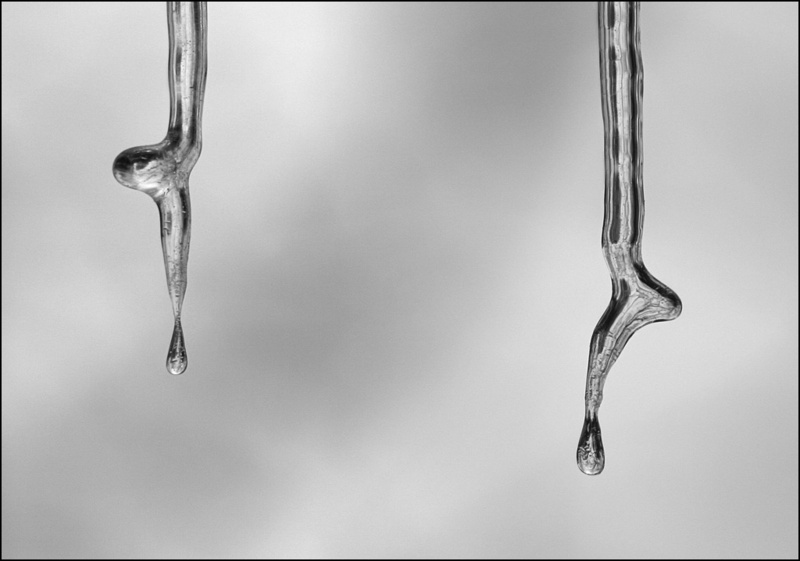 But apparently the temperatures stayed right around freezing for long enough that the icicles evolved in some interesting ways I've not noticed before. All were focus-stacked, to get enough DOF while keeping the background completely OOF. 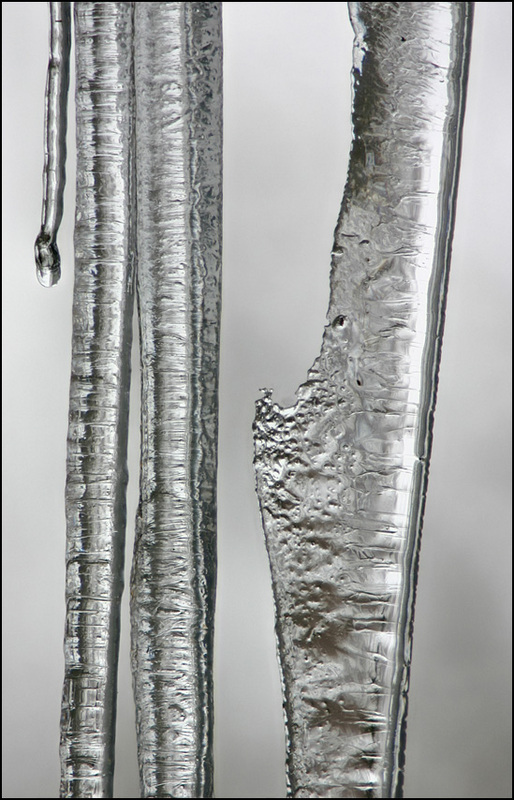 Shot through windows from inside a nice warm house, so both the icicles and I could be in our natural surroundings. Hope you find these interesting! Technical details: Canon 55-200mm EF USM at 200mm f/5.6 plus Kenko tubes, Canon 300D, Zerene Stacker. 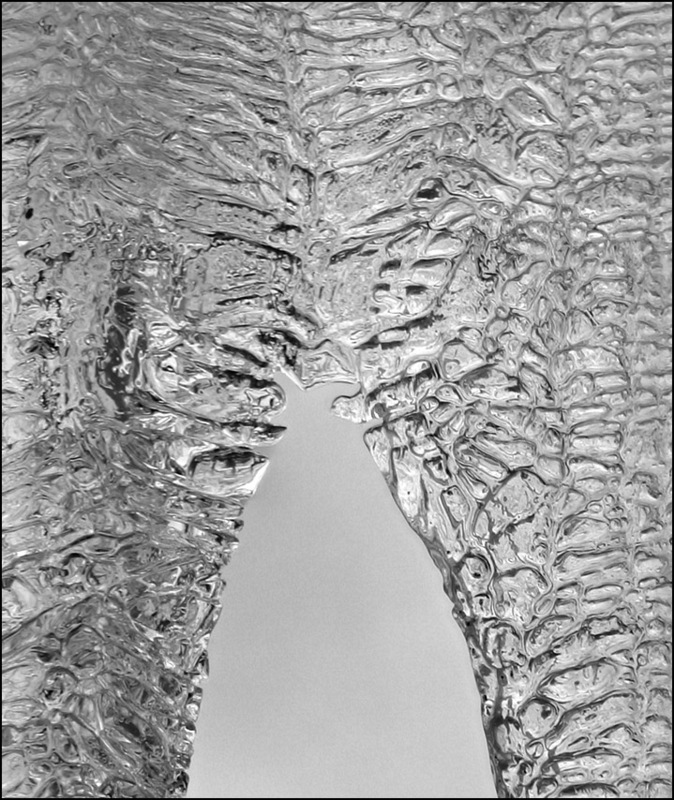 Think you often get very odd structures in the ice if it goes though freezing and thawing cycles - it can almost look cellular. The second one is especially fascinating! What would happen if you applied cross-polarisation techniques to such a subject. I have no idea. I wondered about that too, but it was pretty inaccessible -- hanging a couple of feet outside an upstairs window with no easy way to get a polarizer on the back side. This sounds like the sort of thing that LordV might have played around with? No still haven't got any polarisation sheets. I do try to get a multi coloured object behind ice as it helps accentuate the structures within the ice. I do try to get a multi coloured object behind ice as it helps accentuate the structures within the ice. I was lucky in this case because in the background were some nice dark trees to make patterns in the ice. The trick then was to tweak the camera position so the line of sight included only small branches, and to use the widest possible aperture so the background stayed more or less uniform gray. That's where the stacking came in. When I tried getting DOF by stopping down, the background went ugly. An easy way to put a LARGE polarizer behind the ice is to have a clear blue sky there that is at right angles to the sun.